The first time we took our boys to a climbing gym, they stood close to us and stared up in awe at the sheer height of the climbing walls in front of them. Adults and kids were hooked up to harnesses, climbing with all different skill levels, but all making their way higher and higher until they couldn’t go on any more. Our boys looked around at their options and quickly chose a smaller climbing structure that looked…safer. We have boys who wrestle and cannonball and take all kinds of risks, but rock climbing was new to them and they weren’t quite ready to jump right up on the wall – and we chose not to push them at first as they explored this unfamiliar terrain. The time came, however, for us to give them a little challenge, to have them try what we went there to do. My husband took the boys to the beginner wall and asked them to each give it a try. If they didn’t like it, they could go back to the rock they had already conquered. As soon as we got them out of their comfort zone and onto that big wall, they couldn’t get enough. Success was not immediate, but they enjoyed the challenge and went higher each time they attempted it. Our oldest almost made it to the bell at the top. They were begging to stay longer when our time was up and constantly talk about going back. That day at the climbing gym has proven to be full of life lessons even months later. The feelings they experienced have stuck with them and provide great lessons for all of us in the area of courage and faith. The small rock they climbed at the beginning was a comfortable spot. It didn’t require ropes and hooks and they needed very little help. This is where we all want to hang out most of the time – not relying on anyone or anything but ourselves to just get by. The tall wall made ropes, harnesses and a spotter necessary. It could not be scaled without extra help. And this made it scary. Stepping outside of our comfort zone is scary, but as adults we’ve had to do it over and over again. Whether we’ve learned our lessons or not, we have seen God come through in these not-so-comfortable endeavors. Outside of our comfort zones, we have grown and been stretched. Our faith is forged and strengthened outside of comfort zone. Now it’s time to help our children step out into new challenges where their faith can grow! 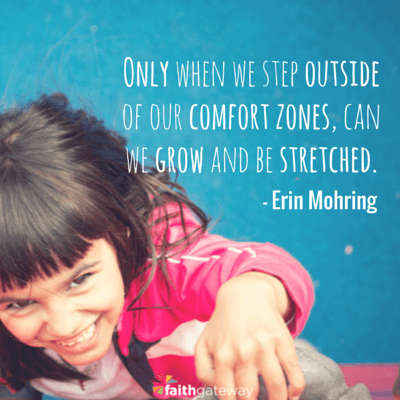 Head over to the Faithgateway blog, where I’m writing today, to read my suggestions for helping kids step outside their comfort zone! This entry was posted in Blog and tagged Boys, Comfort, Comfort Zone, Parenting by Erin Mohring. Bookmark the permalink.